In 1990, the first litter of Dalmatian puppies was born under the kennel name Of Dalbury’s Clan. 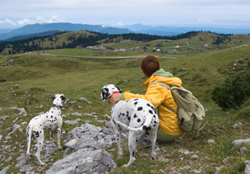 From that moment onwards we have been actively involved in breeding Dalmatian dogs. We can safely say that we have learned and experienced a lot over the past years. All this knowledge and experience helped to form our vision for the breeding of this fun and lively breed. Why did we make the choice for Dalmatian dogs? Mainly because every Dalmatian has his own unique character, which makes them have something humanlike. They’re also pretty stubborn, which suits us. Their social and especially playful behaviour makes Dalmatians very suitable as a children’s companion. Their social behaviour towards other animals and their natural getting along with horses. Their social behaviour towards other Dalmatian dogs, and especially their own members of the pack. A Dalmatian loves to live together with at least one other Dalmatian. Their unrivalled endurance. A Dalmatian is ideally suited for sports. People who love running, cycling or participate in triathlons have a tireless enthusiastic friend in a Dalmatian. These dogs are also very suitable for dog sports such as flyball, agility, and even hunting training. Their extraordinary intelligence that can lead to grey hair among some people. Don’t try to fool a Dalmatian, because they will fool you right back. Their happiness and eternal loyalty will quickly make you love these dogs. Add to this that they are very clean and are always in for games with you and/or the children, and you have found the ideal family dog. Or not? They shed little white hairs all year long, that will stick to everything and are difficult to clean. For people with very small children and/or a baby, who never had a Dalmatian before, this dog might be too large and strong. Unless people have already experienced a Dalmatian before, or another larger dog of a similar breed. Their endurance and tireless energy means that the owner has to take at least a one-hour walk every day. Riding your bike with the dog is also great, but can’t be don’t until the dog is 1 or 1,5 years old. You have to be able to spend this much time on the dog! Without this very necessary exercise, your Dalmatian will become restless and/or rowdy inside the house. You have to think about it a lot, before choosing to have a Dalmatian. You have to weigh the pros against the cons to become devoted to this special breed for life, in case you say “YES”.